Time to save on your cleaning supplies! Lysol Canada is the Maker of household disinfectant sprays, surface cleaners, hand soaps and bathroom cleaning products. Did you know that some germs may be able to survive for several days on household surfaces like kitchen counter tops, tables, sinks, and tv remotes? Want to learn how to prevent food borne illness, keep a sanitized bathroom and clean home? Flu season seems to be in full swing, and you know that your kids will be exposed to all types of germs. to teach Kids about healthy habits and fighting germs. with tips to reinforce healthy habits. Plus download a poster for a Free handwashing guide. (scroll down to page bottom to print). A Student Activity book filled with Missions that provide various educational elements including creative thinking, reading, writing, and more. Parents, feel free to browse this section as well. Lysol Canada has a Freebie offer. 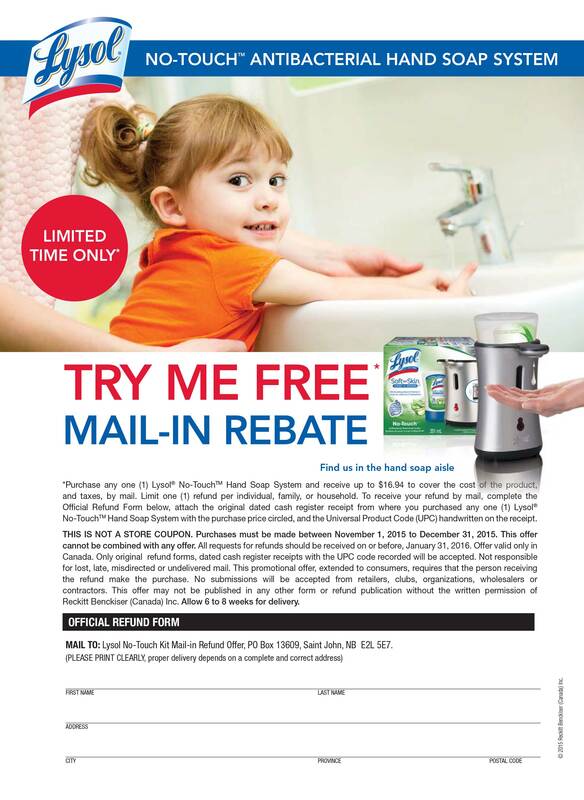 Print the MIR offer to receive a FREE Lysol Hand Soap Dispenser with a mail-in rebate. Purchase must be made between August 3rd to October 31. Limit one rebate per person, family or household. Limit one (1) refund per individual, family, or household. Listed below you can find all the coupon pages and sites, where Lysol coupons may be found. There may printable Lysol coupons on our Smartsource page. Click here and print. You are allowed to print the coupon two times per computer or device. visit Lysol here to get see if these and other savings are available today. coupons may be found in issues of the Smartsource coupon inserts.